JD4JC hasn't added any friends yet. I've had good luck with freeze-drying peppers (really-really dry!) and pulverizing them into powder that can be dispensed from salt shakers to taste. Below is a picture of a quartet of powders we sent our son who is serving in the USAF in Germany. We've found that about 1/8 tsp of the Ghost is sufficient to nicely season a pint of cottage cheese, and have been surprised how potent the habanero and cayenne powders are. The jalapeñno dust is great on breakfast eggs! Also tried Little Debbie shortbread rollups. Came out good, but the "strawberry" filling squirted out a little bit. Tasted and felt like cotton candy! Easy to scrape off. Just finishing a batch of freeze-dried Hostess Twinkies for G'Kids stocking stuffers, along with previously F-D ice cream sandwiches. The Twinkies come out amazingly good, sort of like giant fortune cookies! They don't need to be rehydrated, and are very tasty, but quite different from their prior status! Also, F-D Hostess Twinkies are also quite a treat! The ghost pepper processing went well. I freeze-dried them extensively, and they were very easy to powder in our Ninja processor. I did the deed outside on the deck with a moderate wind blowing away from the processing activity. I was very careful, but did not use any protective gear. I did get just a teeny whiff and ZOWIE!! 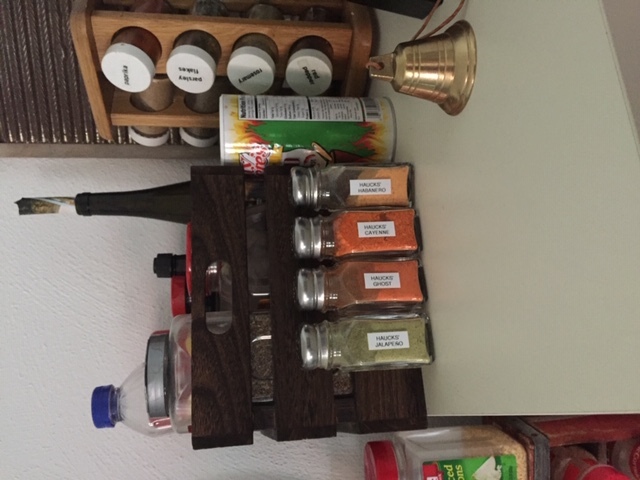 I have the powder in a vacuum sealed canning jar, and a small amount in a salt shaker on our dining table. Same with freeze dried and powdered jalapeño and habanero peppers. The powders don't show any sign of caking or clumping, even with no additives, and it's fun to have a variety of "zap on tap" on the table. A pinch of the ghost pepper powder in a pint of cottage cheese makes a very tasty product! They start losing flavor as soon as you grind them. I dry them cut in half and store that way. I grind them as the need arises, you retain much more flavor that way. I do the same with the garlic I dry, I dry them as little chips, store and grind into powder as needed. 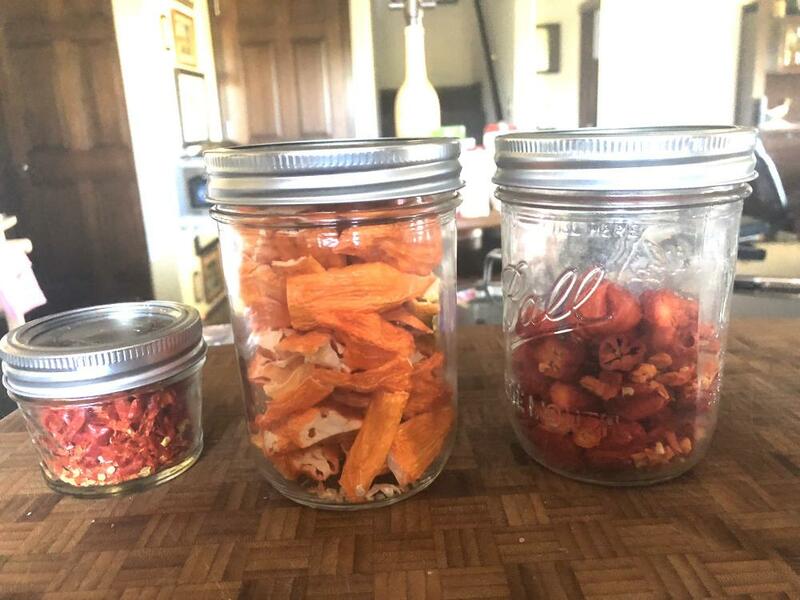 I freeze dry my ghosts, jalapeños and habaneros, powder them and store them in vacuum jars. I don't think that they will loose any potency for years! Here's an image of ~5 Lb. F-D tomatoes, skins, seeds and all. After drying, we powdered them in a blender, and the powder originally filled the whole quart jar. I guess it rehydrated somewhat and shrunk. HarvestRight told me that with the oxygen absorber and vacuum seal, the dried tomatoes would last 25 years if stored in a cool, dark place. The HR F-D machine will vacuum seal quart canning jars with the racks out of the chamber, and by plugging the vacuum pump directly into an electrical outlet and turning on the power switch. The FD Toms rehydrate on approximately 1:1 ratio (Water:Powder). It makes wonderful tomato paste, tomato sauce and pasta sauce. I just added about 1/2 Tsp of garlic granules, onion powder basil and dried oregano to 1C of powder + 1C water (adjust the water amount to determine thickness of the sauce), simmer for 30 mins to soften the seeds (or less if you process the sauce in a counter blender or with a stick blender. Exceptionally good! Is there not a way to rotate images once uploaded? Here are pix of the post freeze-dried results. 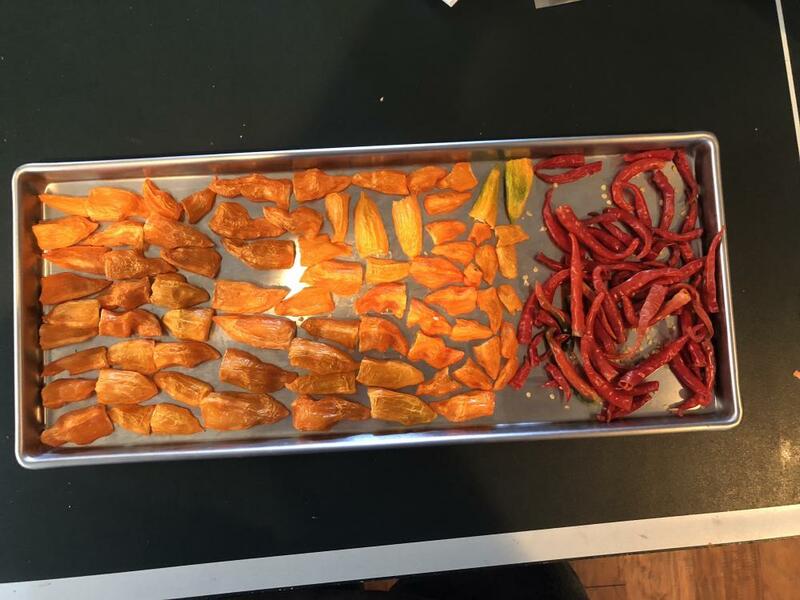 First photo is the tray out of the dryer, second is of three vac-sealed jars with Ghost Peppers, habaneros and cayenne peppers, waiting for me to gain the courage to powder them. (I don't now why the posting shows the habaneros as orange, as they are actually pretty bright yellow). Unfortunately, our nine-week old Australian Shepherd grabbed one of the little Ghost chunks that fell on the floor, but happily I got it away from her before she chewed it up. In any event, she welcomed ice cubes to cool down the problem! I am experimenting with our new HarvestRight freeze-dryer. We FD'd 25 Lb. 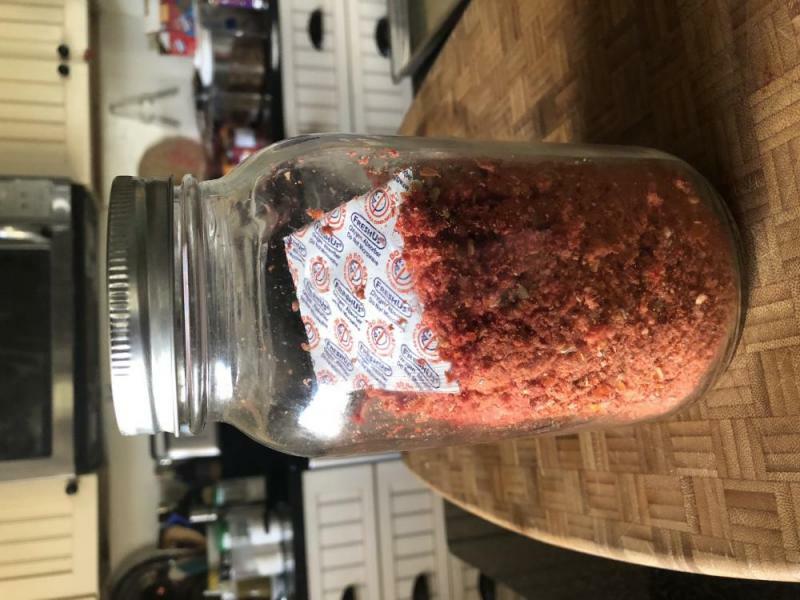 of fresh tomatoes that a neighbor gave us, powdered the processed wedges and saved into quart canning jars, not vacuumed, but with an oxygen absorber packet in each. The 25# of tomatoes turned into four quarts of powder. We've also F-D a small number of Ghost Peppers that we raised, and I'm working up my courage to powder them in a blender. A suggestion from another thread was that I use a hazmat suit for that stage. Now what to do with the powders. Suggesitons? Five full trays. Wow! 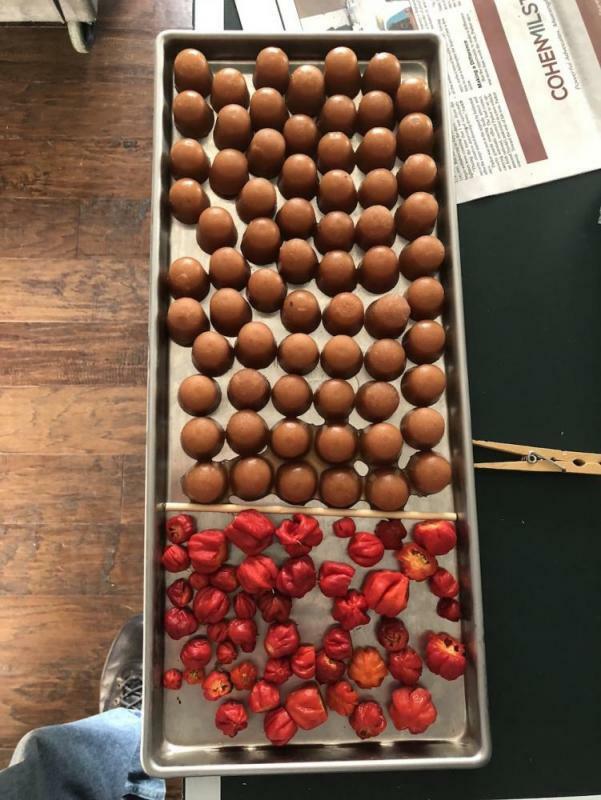 I only ran about 1/4 of one tray. I guess we have a lot to learn about growing these babies, as the largest one we harvested was less than one inch! I'd love to know what you do with your dried Ghosts! [Edit] And I did run a long drying cycle as I also simultaneously processed four 1" thick frozen New York Strips that had been cooked sous vide and were full of moisture! No, but I cut the stems off, and that seems to be an adequate path for the moisture to exit. Your thoughts? Here's a pix of the tray with the GPs. The other stuff on the tray is applesauce drops, pre-frozen in silicone ice drop (cubes?) trays. BTW, F-D applesauce is awesome!